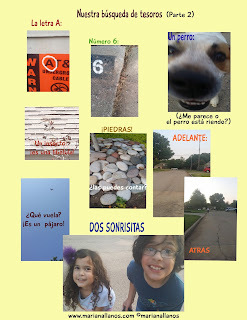 The following is a guest post by children's author and Latina mami of three, Mariana Llanos. I knew right at that moment that I had to act, and I came up with a plan to make our Spanish language journey happier and more consistent. Although I don’t ‘make’ her speak in Spanish after school, I make a point to talk to her only in Spanish as soon as I pick her up. So the questions, “How was your day?” “Who did you play with?” “What was your favorite thing to do at school?” are only spoken in Spanish. At first she answers in English (I repeat in Spanish), and little by little she begins to switch code. Since we walk home from school, I point at the color of the trees, I talk about the weather, and we count acorns or whatever other treasure we find. Her Spanish of course isn’t fluent. But neither is her English yet. She has the ability to understand both perfectly. I certainly don’t want Spanish to feel like a chore. I want it to feel fun and good. I want it to be the language of family, laughter, and memories. I’ve developed a game with the help of my children. It’s fun and easy to play, and it’s a great excuse to get together and speak in Español. I hope you join us on this Búsqueda de Tesoros. A smart phone/instructions/a pencil. Go to a park or take a walk around your neighborhood while you give the instructions. Take pictures as you find the objects. Encuentra algo amarillo, rojo, blanco y verde. Encuentra un animal. ¿Qué animal es? Encuentra un insecto. ¿Qué insecto es? Encuentra una flor. ¿De qué color es? Da doce (12) pasos (cuéntalos en voz alta) y toma una foto de lo que está adelante tuyo. Ahora voltea y toma una foto a lo que está atrás tuyo. Take all your pictures and uploaded them in your social media with legend of what you found. If your child is old enough, let her type the object herself. This game can be expanded and adapted to different age levels. You can also change the objects every week and you’ll have a brand new game. Also, if you prefer not to upload to social media, you may print your photos and paste them on a poster board. Then have your child write the names of the things you found together. 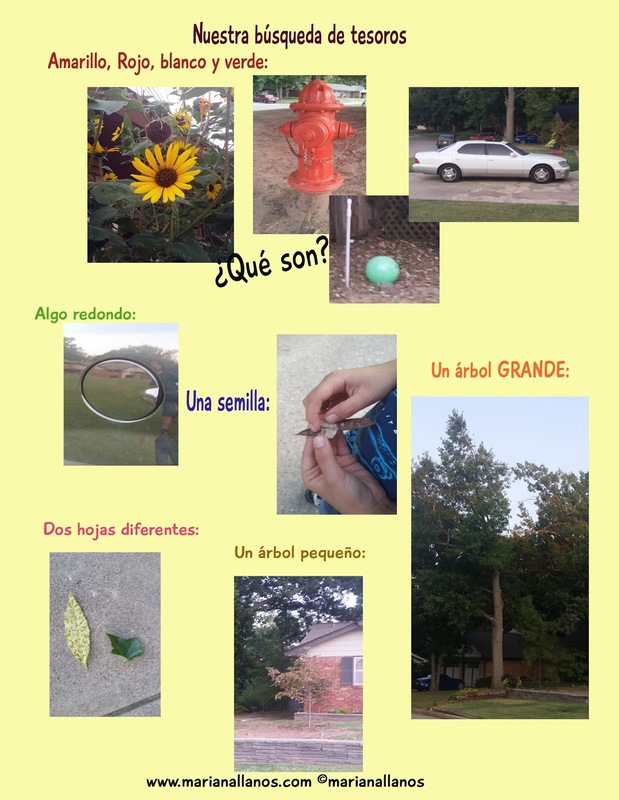 I hope this activity helps you keep Spanish alive at home. 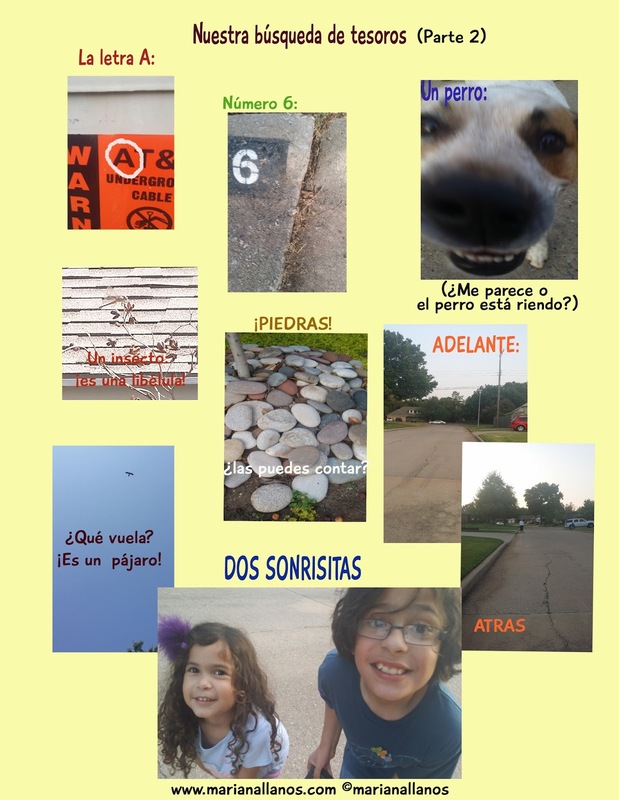 Also don’t forget to READ and sing in Spanish, habits as important as learning your uno, dos, tres. Mariana Llanos is a Peruvian born writer of children’s books in English and Spanish. She lives in Oklahoma with her family. To find her books go to: www.marianallanos.com or www.amazon.com/author/marianallanos. Connect with Mariana’s page on Facebook.